I love Rosh Hashanah! It’s such a charged time of the year, when we reflect on the past year and reset and refocus on the year ahead. I also love the traditional foods we eat at the Rosh Hashanah table – apples, honey, pomegranates, dates…. Like most Jewish holidays, the food we serve has symbolic meaning. Traditionally, sweet foods (apples, honey) are served to bring sweetness to the year ahead and the challah for Rosh hashanah is woven into beautiful, round loaves to highlight the cyclical nature of the year. 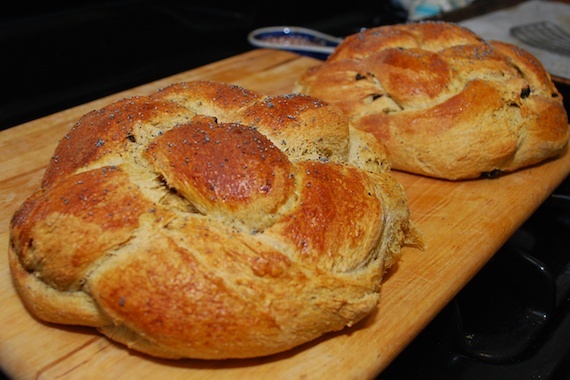 I was excited to try to make a sweet, round challah this year, and I used this sweet potato challah recipe (modified from Joan Nathan) as a starting point. Since we received 2 beautiful acorn squashes last week from our CSA share, I though it might be fun to try to make a sweet squash and raisin challah. After watching this video about how to make a round challah, I felt confident to try to braid it and it was much easier than the fancy finished look of the loaves would suggest! Wishing everyone a sweet new year – L’shana Tova U’metukah! 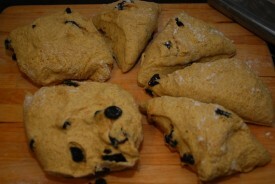 Modified from Joan Nathan’s Berches recipe from The Jewish Holiday Kitchen. This recipe makes 2 large loaves. About 3 cups roasted, mashed acorn squash puree (still lukewarm); you can substitute use any winter squash for the acorn squash. I’m sure you can even use canned pumpkin in a bind! Mix the flours together in a large bowl, and make a deep hole in the middle of the bowl by moving the flour towards the edges of the bowl. 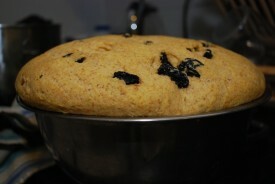 Pour in the yeast and 1/2 cup of water into the well. 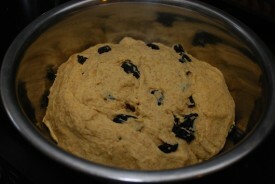 Add a small amount of the flour, about 3 tablespoons, and mix to make a very watery sludge. 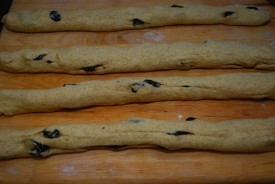 Cover and place in a lukewarm place until doubled in size, about 30 minutes – it will be very fizzy when ready. 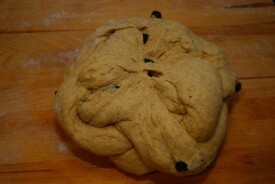 When the dough is ready, place it on a floured wooden board and split it into 4 parts. Place 2 of the parts into the bowl the dough was in, and cover. 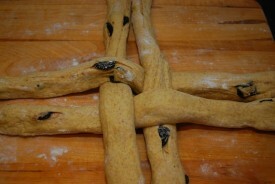 Split the other 2 parts in half so there are 4 equal parts; roll these into long logs of equal length. 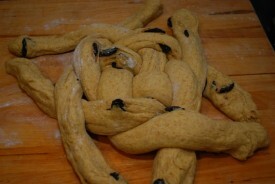 Shape into braided round challah. 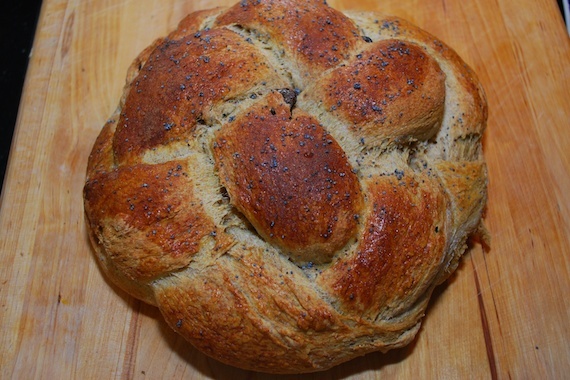 I have included detailed pictures below, but Tina Wasserman’s video is pretty great – she shows 3 different ways to make round Rosh Hashanah challah. The most important thing to keep in mind is that you flip it over after you braid it – so it will look much neater after that final step! 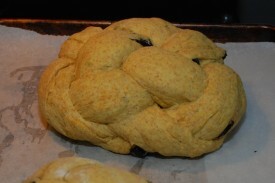 After the challah is shaped, place on baking sheet pan lined with parchment, and cover with a kitchen cloth. Repeat with the other parts. 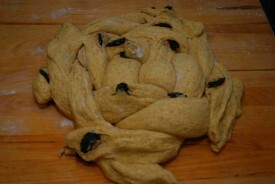 Cover the challah and let rise once more for about 1 hour. When ready to bake, brush with olive oil or egg wash and sprinkle with poppy or sesame seeds; I used poppy seeds and cinnamon and sugar. Bake 45 minutes to an hour or until the challah is nicely browned and sounds hollow when tapped. This recipe is included in this “Rosh Hashanah Blog Carnival”, a list of links to seasonal recipes from like-minded bloggers compiled by Lisa at Real Food Digest. Her blog is an incredible resource for whole-food, minimally processed recipes. 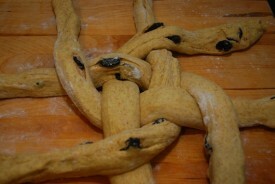 Any ideas on gluten free challah? Great idea with the squash! I made a pumpkin challah the other day and it was too tasty for words! look easy to make it. but after try…huh.. but thanks for share, nice recipe.